A few days ago I had my 49th birthday. The Lord has been so good to me. Not that life is easy. In fact, the last few years have been painful because of significant loss and also with intensive emotional healing. I have lifted the lid to my past and acknowledged the dysfunction and brokenness of my childhood, inviting Jesus to heal me. Excruciating and yet liberating. But it has been tough for my parents too. I understand. Almost every parent, Christ-follower or not, tries their hardest and wants the best for their kids. It’s heart wrenching to find out that despite your best intentions and efforts, it wasn’t enough to protect them from being damaged in some way. However, in celebration of my birthday, I want to reflect on the rich blessings poured out on me. For starters, I give thanks to the Lord for my mom. My mom was 18 years old when she found out she was pregnant. The doctor recommended she have an abortion. After all she was young and had just started college. Despite the conventional wisdom of the day, she chose life for me. For that reason alone, I am deeply grateful. My parents got married and wanted a happy family, but it didn’t work out. It was difficult and confusing to navigate divorce as a child. I would have loved to have been raised by two parents on the same team in the same household. Nevertheless, they invested in my life in different ways and taught me some valuable lessons that continue to shape me. Today I want to share with you three things I learned from my mom. It’s never too late to change. My mom committed her life to Christ at the age of 32. She had done a lot of living before then, marked by broken relationships and poor choices. I have heard her compare herself to the woman at the well in John Chapter 4. And like the woman at the well, my mom was radically changed when she encountered Jesus. The Savior lovingly reached out to her, she took His hand, and I have witnessed her walk out the process of glorious transformation. No matter her age, my mom is committed to growing personally, in her relationship with Christ, and in her relationships with others. In fact, her marriage to my step-dad speaks loudly of her desire to change. After suffering through three divorces, my mom recently celebrated twenty years of marriage to her beloved husband. Always take the high road. Most of my mom’s career has been focused on public sector and non-profit work. She is an excellent administrator and has great skills in networking and building partnerships. Unfortunately, she has also been viewed negatively by others who felt that she threatened their agendas. My mom has been the recipient of ugly words and treatment. At times, she has endured immense pressure. Regardless of how she is treated, my mom will not stoop to their level. She stands firm in her position, but extends kindness and respect. She is not two-faced; she does not speak negatively about others. My mom relies on the Lord to help her respond with truth, honesty, and integrity. And, no matter what, to love and pray for those who opposed her. Be brave enough to acknowledge your mistakes. It is hard for most people to admit they are wrong. A sense of fear or shame can be powerful when looking at our failures. We want to hide or bury the mistake, or we respond defensively out of self-protection. Yet, my mom can look at fear or shame, take a deep breath, and muster enough courage to deal with past and present issues—whether small or large. She taught me to be brave enough to acknowledge little mistakes. Rather than lying to cover it up or getting angry at the one who pointed it out, she takes responsibility. Having nothing to prove, she says something like, “Oh, that was me. I did it. Sorry about that!” My mom also taught me to be brave enough to look at the big mistakes. This ability has been a gift to me especially while on my own healing journey the last few years. As I have talked with her about childhood abuse and trauma, she has listened with grace. She does not justify herself. She does not minimize my experiences. Instead, she tries to understand my perspective and see how she contributed to my pain, even though her motivation as a parent was not to hurt me. I have tried modeling this approach with my own adult children. I know I have not parented perfectly. Even though it is scary, I want to be brave enough to acknowledge my mistakes, and see my kids experience the healing they need. As I embark on a new year and approach the age 50, my goal is to incorporate these lessons into my life more fully. I am so thankful for my mom and the things she taught me. I hope that her example is an inspiration to you, as well. I encourage you to use her lessons as tools to help you thrive in life and in the positions God has called you. But grow in the grace and knowledge of our Lord and Savior Jesus Christ. To him be glory both now and forever! Amen (2 Peter 3:18). Heavenly Father, thank you for teaching me and speaking to my heart. Help me to learn from parents, mentors, and others you have placed in my life, and to apply their wisdom. Continue to mold me and make me to be more like You. In Jesus’ name. Amen. Insecurity can wreak havoc on a leader’s effectiveness. After all, it’s tough to love followers and put their best interests in mind when you’re looking over your shoulder in self-protection mode. Nagging self-doubts grow into attempts for affirmation. The search for validation interferes with equipping others to succeed. Next to knowledge of God, a knowledge of who you are—especially who you are in Christ—is by far the most important truth you can possess. There is great freedom in knowing and appreciating your identity! Do you know who you are in Christ? Study what the New Testament says about your position an Christ. [F]or you are a chosen people. You are royal priests, a holy nation, God’s very own possession. As a result, you can show others the goodness of God, for he called you out of the darkness into his wonderful light (1 Peter 2:9, NLT). You belong to a family distinct from the common world, selected with kindness, favor, and love. You are granted the highest position and possess the dignity of showing the Lord’s majesty to the world. You are like God in character. You belong to God, and He’s given you His name. Take time to know who you are in Christ. “Knowing” means having an intimate personal connection, not merely being aware of facts and circumstances. When you know who you are in Christ, it is a powerful game-changer in life and as you lead. If you follow the story of the British royal family, you know that William and Kate recently gave birth to Charlotte Elizabeth Diane Mount Batten-Windsor. This little girl will be trained as early as possible to live up to her name, so by the time she is in the public eye her actions will be automatic. She will know that she is a princess and she will know what she is supposed to do. Kate, officially called “Catherine, the Duchess of Cambridge” was not born into royalty. She had to take lessons, and I’m sure she is still learning how to behave. But she knows who she is and that there is a proper way befitting of royalty to do things. Who are you? A royal, holy child deeply loved by God with all the rights and privileges. You know what to do. Live like Jesus in this world; worship God and do His will. Show others the goodness of God, because He called us out of the darkness into His wonderful light. Perhaps like the Duchess of Cambridge you’re still learning. Thankfully when you’re not sure what royalty looks like, there’s the Royal Manual—God’s Word—to consult. When you know who you are, you have what it takes. We may be royalty, but we live in a world in which we are not citizens. One day we’ll return to our heavenly home which is perfect, without sorrow, pain, sickness, or difficulties. But until then there are challenges around us. However, when you know that you know that you know that you a royal, holy child deeply loved by God with all the rights and privileges, you have a confidence that cannot be moved. You cannot be shaken when life gets hard. Knowing who we are does not mean we are superior to others. On the contrary, we are like Jesus who said that the greatest is to be servant of all. We use our position to serve and love others, to reveal God’s glory wherever we are. When we know who we are, we live in God’s strength. By his divine power, God has given us everything we need for living a godly life. We have received all of this by coming to know him, the one who called us to himself by means of his marvelous glory and excellence (2 Peter 1:3). Know who you are. Live, love, and lead as a favored child of the Most High God! Our culture prizes productivity. People bemoan how tired and busy they are, but they do not stop to evaluate how to live differently. Everyone is caught in this rat race and there is nothing they can do about it. The value of activity and busy-ness has infiltrated the Church. Although Christians may have different Biblical interpretations about Sabbath, most of us would agree that Sabbath is important. However, it is all too easy to give lip service. Yes, we know it is a good thing. However, we are under grace not under the Law. We don’t have to observe Sabbath. When we approach Sabbath from a legalistic bent, I believe we miss the point. Jesus Christ taught that “the Sabbath was made for man, not man for the Sabbath” (Mark 2:27 NIV). The Sabbath was created to meet the needs of people to rest and worship. In order to thrive in life and in God’s calling as leaders, it is crucial to invest in our own well being by regularly setting aside time to honor God and enjoy His blessings. Up until a few years ago, I did not really understand the importance of soul-care. Over time I have learned the power of Sabbath in renewing my soul. If you are still pondering the merits of Sabbath, here are some things to consider. The Sabbath is a gift from God. During the week of creation in Genesis 1 and 2, God modeled the Sabbath for His children. We were made to work hard for six days, and then cease from work on the seventh day. The day we set aside to rejuvenate is not as important as the rejuvenation itself. Our Creator knows that our bodies need rest. It seems counter-intuitive, but the most productive people are not the ones who burn the candle at both ends, continually pushing themselves beyond their limits. Research shows that the most productive people nap when they are tired, get eight hours of restful sleep at night, and are in tune with the needs of their bodies. Sabbath is a gift, not a restriction. When we enter into a rhythm of rest we function according to God’s design. The Sabbath emphasizes simplicity. We cannot do everything. In order to incorporate the gift of Sabbath in our lives, we must listen carefully to the Lord about how to arrange our time. There are certainly many good things in which we could be involved. However, we must only say “yes” to the things that are best. That means letting go of things that are good to build margin in our schedules. Life becomes simpler when we guard regular times for rest, relaxation, refreshing activities, and worship. Last year my husband issued a challenge to our congregation. He gave a blank monthly calendar to each family and instructed them to select one day each week on which no work, appointments, or other non-restful activities were scheduled. This exercise helped families to simplify their lives by deciding and focusing on what is really important. The Sabbath reveals our trust in God. When we take the bold step of incorporating Sabbath in our lives, we affirm that God’s ways are best. We demonstrate that we really believe that He is in control. We can take time to rest and refresh with confidence that the Lord will give us the time and strength we need to accomplish His will. We stop making excuses. We cease our striving to “make things happen,” and learn to lean on Jesus. We discover the joy, peace, and beauty of His presence as we observe Sabbath as an act of worship. Do yourself a favor…don’t wait until you encounter burnout or health issues that force you to slow down. Do what is necessary to include Sabbath as a life style, and reap the astounding benefits. Even though it was the weekend, we understood what she was saying. Monday—the first day of the work week, the end of relaxation and joy, and the start of another dreaded weekly grind. Monday—where Murphy’s Law is bound to be unleashed. Nothing good can possibly come from Mondays! I’m not trying to discount the difficulties our cashier was encountering. In this broken world I can imagine some pretty heartbreaking and infuriating scenarios. However, I also know that as leaders—people to whom God has entrusted influence—we are called to a different approach. In the book, Loving Mondays: Succeeding in Business Without Selling Your Soul, John Beckett describes his journey of discovery that transformed his approach to work and leadership from drudgery to meaning and purpose. By integrating faith into leadership he brings an attitude of worship and joy wherever he goes. Whether you’re called to the marketplace, ministry, your family, or some other place of influence, it is possible to love Mondays. Here are some tips to get you started on the road to loving Mondays (and any other day of the week). Start the day with God. This really is where it all begins. You may not be a morning person, but establish a way to connect meaningfully with Jesus. He has given you life and breath and strength today. He abides in you; you abide in Him. Through the power of His Spirit you can declare, “This is the day the Lord has made; we will rejoice and be glad in it” (Psalm 118:4). Search for the good. If your mind is set on finding the negative, that’s what you will see. Fortunately, the reverse is also true. You can find the good in any situation. Consider the perspective of eighteenth-century Bible scholar and preacher Matthew Henry after he had been robbed. Step out first. As influencers we are also initiators. People look to you and will follow your example. Don’t wait for the perfect opportunity or until you feel like it to act. Be the one to initiate kindness. Brighten the day of someone else. Remember “it is more blessed to give than to receive” (Acts 20:35), and it’s contagious. 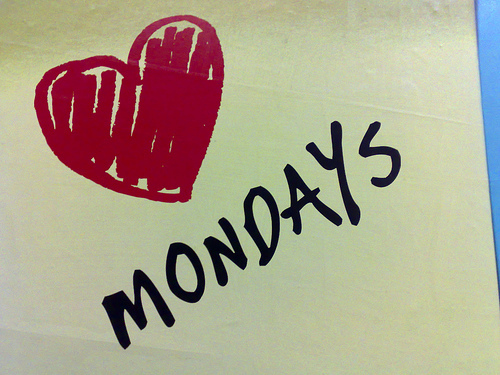 Learn to love Mondays, and others in your circle of influence will learn to love Mondays, too. 1. James S. Hewett, Illustrations Unlimited: A Topical Collection of Hundreds of Stories, Quotations, & Humor for Speakers, Writers, Pastors, and Teachers, ed. (Carol Stream, IL: Tyndale, 1988), 264. I spent an amazing Saturday at “She Leads: Her Voice,” a conference to empower women to lead where they are and release them to become who God designed. I was blessed to be included in the line up of speakers. However, at the end of the day, I felt that I had received so much more than I had contributed. The Lord took 12 Ted-Talk-style messages, delivered by 12 women with diverse personalities, styles, and experiences (who did not confer ahead of time), and wove them into a tapestry with one common thread—being the leader God has called you to be. I wish you had been there with me, to soak in the passion for Jesus and authenticity of heart for yourself. In an effort to give you a taste of the rich wisdom imparted through this event, I pass along some nuggets of truth. Authentic leadership requires the willingness to be vulnerable, keeping an open heart during difficulties instead of numbing. Only go where the Lord leads you, and then move forward with courage. Separate seeking affirmation for what we are doing from seeking affirmation for who we are. Stewardship involves more than money. It encompasses everything that we are and have. And, it all belongs to God. Learn to manage God’s call to avoid burn out. It’s never too late to be who you might have been. It’s time to take your future back. Learn to trust Jesus with your broken places. Hiding from brokenness creates a destructive emotional cycle. God is concerned with the condition of your heart rather than how you look on the outside. Make it your goal to reflect Jesus, not your expectations of who you should, could, or ought to be. God’s goodness is seen through creation and His plans. The core of His goodness is seen through Jesus. When things are difficult and there are no answers, Jesus is enough. When God calls you to lead, don’t limit His plans by your preconceived notions of what that looks like. “You’re not doing it wrong.” There’s no “right way” to lead. There’s no “right way” to do you. Be encouraged to lead where God has placed you, using the strengths and passion He has given you.